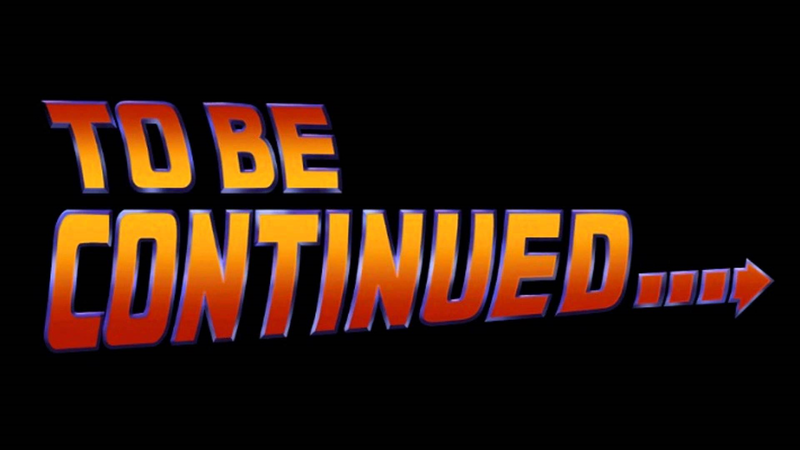 The Back to the Future series begins to get quite confusing by the second installment of the franchise. It's this entry that explains most of the more confusing aspects of Back to the Future: The Game though, so it's an important one to get to understand just how it ticks. Back to the Future Part II begins right where the first film left off, with Marty and Jennifer traveling to the future in the hover-converted DeLorean with Doc to try to stop an incident that causes problems for their future children. That's the first of the most confusing aspects of this film, as common sense dictates that if Marty and Jennifer leave 1985, they should not exist in 2015, so their kids should never have been born. However, it does make sense if you think fourth-dimensionally. Marty and Jennifer can exist in 2015 despite leaving the timeline in 1985 for the same reason that Marty still existed in 1955 despite the fact that he eliminated the moment that caused his parents to fall in love and have children. The ripple effect causes the timeline to catch up to itself slower for those who travel through time. Because Doc, Marty, and Jennifer are time travelers, any changes they make to the timeline don't affect them as quickly as everyone else. 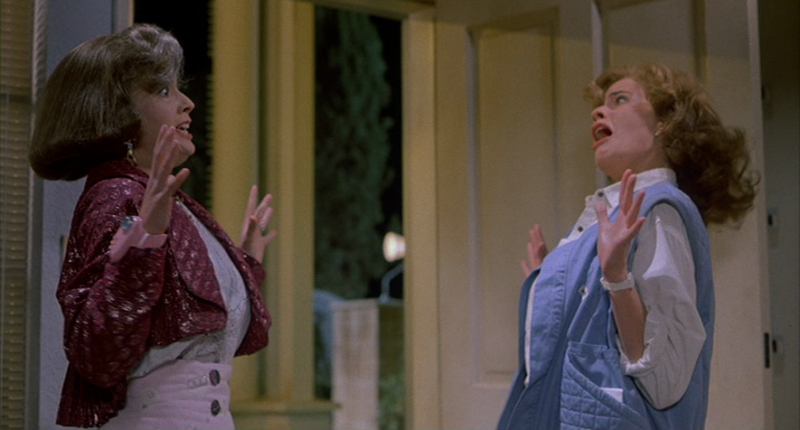 Therefore their future selves won't fade out of existence for quite some time, as it took Marty a week to begin to fade out in the first film. However, if you are a time traveler that makes a change that causes harm to yourself in the past, and then you travel through time past the point where that harm occurred, the ripple effect catches up to you much faster. This is seen when old Biff is in pain getting out of the DeLorean after returning to 2015. In an extended scene in the DVD and Blu-Ray releases of the film, the pain is explained, as Biff is seen fading out of existence. 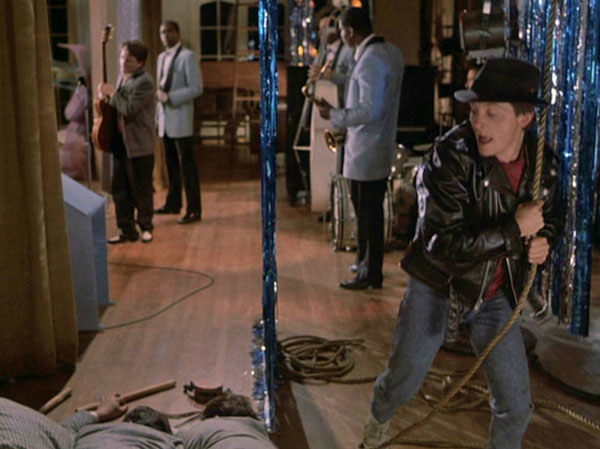 Even though old Biff no longer exists in the new timeline, his cane didn't fade out of existence as the cane itself would still have existed even if old Biff had not purchased it. 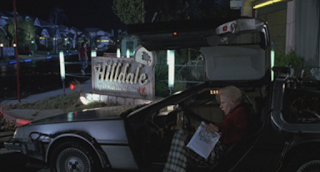 Since Marty, Doc, and Jennifer are time travelers, the cane and the Hilldale of the original timeline are still in the same spot as they were before old Biff's interference in the time stream. Despite old Biff erasing himself from existence, the time ripple hadn't caught up to Marty, Doc, and Jennifer yet. Another confusing aspect of the second film is the whole reason why Doc brings Marty and Jennifer into the future in the first place. 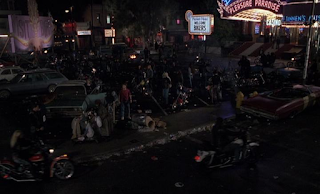 If their kids have problems because of their association with a gang, it would make a lot more sense to just warn Marty about this in 1985 so that he can prevent his kids from ever getting involved in the gang in the first place. This can be seen as one of Doc's eccentricities. Rather than doing things the easy way, Doc went the long way around to solve the problem. However, it's even more involved than it is at first glance, as it has been shown that the Back to the Future universe is cyclical. When Marty and Jennifer get back to 1985, it's going to be tough for them to let things get bad for their kids once they have them, even knowing that their past selves will be there to correct it. If they don't do that though, it will be tough to set things up in motion, as the Doc from when the universe cycles around won't see the newspaper headline that caused the events to be set into motion, since in that timeline, the events never would have happened. However, it's shown that Doc cares about trying to preserve at least most of the cyclical timeline. 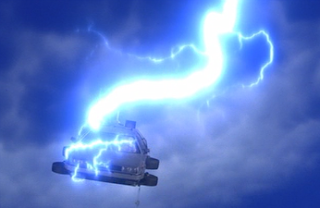 Even though he changed the timeline by saving his own life, he still went through the effort to make sure that Marty still became his assistant, he never told Marty about his adventures in the past, and he made sure that the DeLorean experiment happened on the exact day and time that it did on the tape from the original timeline. Doc would make sure that the events that led to the trio leaving 1985 to go to 2015 were set in motion when the timeline cycles around, despite the fact that the events wouldn't have lined up the same way. This could be as simple as him traveling to the future to remind Jennifer and Marty to stay out of the affairs of their children since everything will be OK. 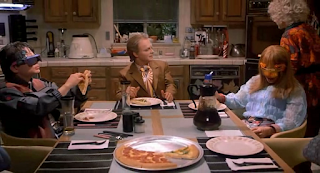 If Marty and Jennifer allowed the events with their children to play out the same way in the new timeline, every piece of the puzzle would still fall into place. 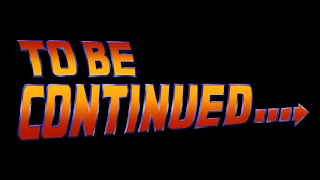 When Doc, Marty, and Jennifer return home, since they traveled through time again and are past the point when Biff changed the timeline, they become affected by the ripple as Biff had earlier. They find themselves in an alternate 1985. In this timeline, old Biff had stolen the DeLorean time machine to give his younger self a sports almanac that told all of the sports outcomes for 50 years. This made Biff a very wealthy and powerful man, which led him to turn Hill Valley into a lawless city, kill George McFly, and make Lorraine his wife. Both the Marty and Doc from this timeline are out of the picture, as Doc has been put into an asylum and Marty has been shipped off to a private school in Switzerland. This allows them to go about their business without running into their other selves. 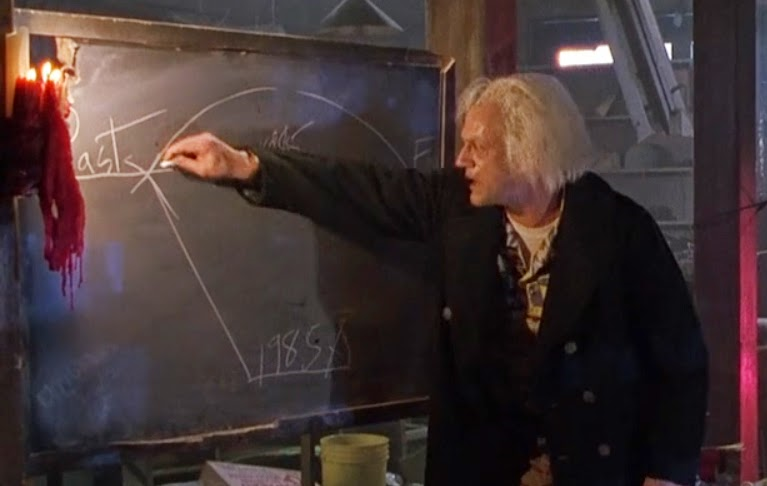 Doc explains that Biff made a new timeline. They have to travel back to the time when old Biff gave his younger self the almanac, as if they travel to 2015 now that the timeline has caught up to itself, they'll just be going to the future of timeline B rather than that of timeline A. So, it will be pointless. Instead, Marty has to talk to Biff to find out when he got the almanac so he can get it at a point when it's still possible to stop Biff from ever using the almanac for financial gain. They find out that it happened the night the lightning struck the clock tower, so they have to head back to the night that Marty went back to the future. Before heading there though, Marty was worried because Jennifer passed out after seeing her future self, and they left her on a porch swing. He was concerned about the consequences of leaving Jennifer and Doc's dog Einstein in Biff's twisted 1985. Doc explains that once they fix the time stream, everything will change around Jennifer and Einstein, and to them, it will be as if that horrible reality never happened. Doc warns Marty that they have to be careful to not come into contact with their other selves, as they don't want to do anything that can lead to Marty not being able to successfully make it back to 1985. 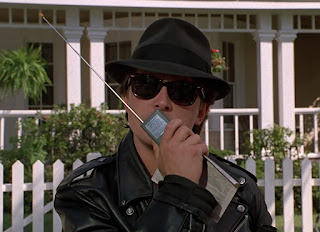 Doc gives Marty his first of many ridiculous disguises, and they communicate with each other via two-way radios while they try to get the almanac back. Doc has to wait until the right moment to drive the DeLorean to pick up Marty, while Marty has to get the almanac back while trying to keep out of sight of his past self. Marty witnesses Old Biff giving the almanac to his younger self, but he misses his chance to get the almanac without Biff noticing, as young Biff is warned by his older self to never let it get out of his sight. Even though it would logically seem that old Biff shouldn't be here, as when he changed the past he never became an old man, the time ripple still allows it to take place. Even though the time ripple caught up to Doc and Marty enough to make the alternate 1985 occur, old Biff was the reason that everything happened, so his presence in 1955 is at the far end of the water, so to speak. As we saw in the first film, when Marty didn't start fading from existence until a week after he made the change to the timeline, the time ripple takes longest to reach the cause of the change to the time stream. Marty now has to get the almanac back from Biff directly, but of course, things don't go as planned. Marty and Doc both just barely miss letting their past selves see them, and Marty has to stop Biff's gang from attacking his past self on stage. In the end, Marty manages to get the almanac back from Biff, with help from the hoverboard he picked up in 2015. Marty then burns the almanac as Doc waits in the DeLorean as it hovers overhead. Everything seems like it worked out alright until the DeLorean is hit by lightning and disappears, leaving Marty seemingly stranded in 1955. He doesn't have to wait long, however, as it turns out Doc wrote a letter and mailed it with explicit instructions to be delivered to an exact time and place 70 years in the future to a young man meeting Marty's description. It turns out Doc is in the Old West, and he left the DeLorean in a cave so Marty could get back to 1985. Marty now heads back to the clock tower to find Doc in order to get him to send him back to 1885 so he can bring Doc back home. 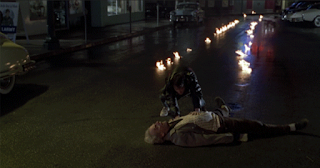 The fact that Marty has shown up immediately after he was sent to the future is too much for Doc to take, and he promptly faints from the shock. 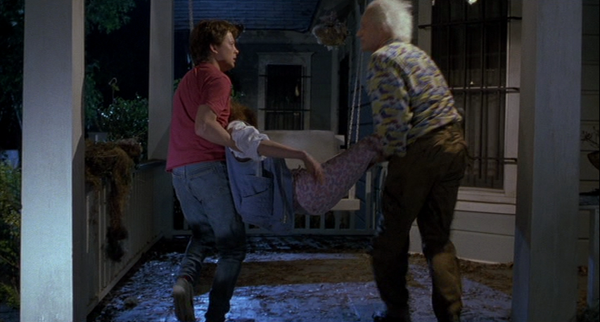 Marty tries to wake Doc up, which will lead us right into the third movie. Thankfully, the second entry is the most confusing of the films, as while the third film has its share of head-scratchers, there aren't nearly as many as there were here.